Heat oven to 400°F. Lightly grease bottom and sides of 15x10x1-inch pan. Place cheese cubes in resealable food-storage plastic bag; place in freezer 30 minutes. In large bowl, stir together sausage, 1/4 cup of the bread crumbs, the Parmesan cheese, 1/4 cup of the basil, the egg, garlic powder, salt and chile flakes; mix well. Cover and refrigerate while cheese is in freezer. In shallow dish, mix remaining 1/2 cup bread crumbs and the melted butter. Shape sausage mixture into about 26 (1 1/4-inch) balls. Working with one ball at a time, make small indentation in center, and insert cheese cube. 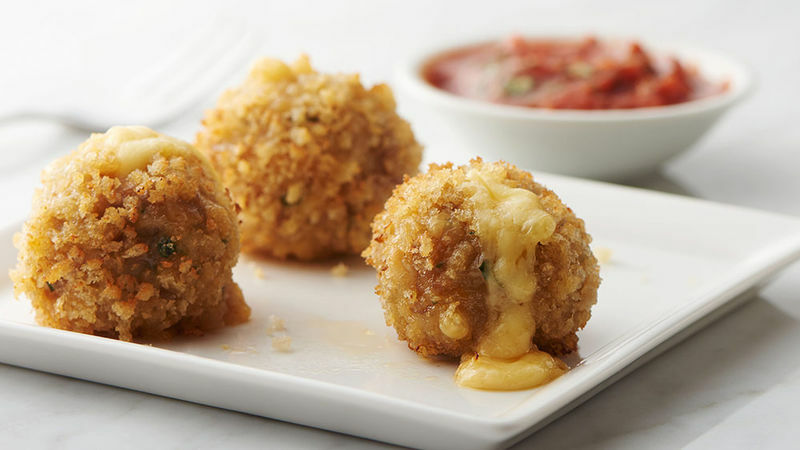 Close ball around cheese; roll in bread crumbs, and place in pan. Repeat for remaining balls. Bake sausage balls 18 to 20 minutes or until meat thermometer inserted in center of ball reads 165°F. Meanwhile, heat pasta sauce in 1- or 2-quart saucepan over medium heat 6 to 8 minutes or until just starting to simmer. Stir in remaining 1/4 cup basil. Serve meatballs warm with pasta sauce for dipping. Measuring the internal temperature of these sausage meatballs is essential in ensuring they are done. Depending on the sausage blend, some pink color may remain at 165°F, but they are fully cooked. Like a little more spice? Substitute hot Italian sausage for regular Italian sausage in this recipe, and omit the crushed red pepper flakes.